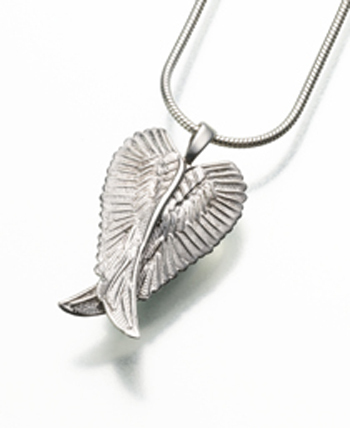 Our sterling silver Angel Wings Cremation Urn Pendant has a raised feather pattern on the front of the piece. It is designed to hold a small portion of cremation ashes, a lock of hair, dried and crushed ceremonial flowers, or burial soil. The Angel Wings Cremation Pendant allows you to hold your loved one close to your heart.